If you asked any CIO at the turn of the century to predict who they would be sourcing their IT infrastructure from in 2018, it is fair to assume that few – if any – would name-check Amazon or Google. Back then, the Amazon brand was synonymous with selling books, and Google was well on its way to establishing itself as the world’s most popular search engine. But – at the same time - both were investing heavily to ensure visitors to their respective sites enjoyed a consistent and responsive web-browsing experience, learning – no doubt – a few lessons along the way about how to run high-performing, efficient IT datacentres infrastructures at scale. In Google’s case, this groundwork has succeeded in helping the search giant become one of the world’s top three public cloud providers, behind Microsoft and Amazon. By its own admission, though, the company still has some work to do to improve the enterprise-readiness of its cloud offerings, and convince corporate IT buyers that – despite its background in delivering consumer services – it knows what makes the c-suite tick. And there were some encouraging signs at this year’s Google Cloud Next conference in San Francisco that its efforts on this front are paying off, with the firm announcing a slew of new customer wins, on the back of the firm’s cyber security commitments, the maturity of its Kubernetes play, and its emerging hybrid cloud story. 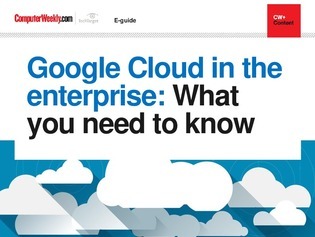 In this e-guide, we provide a round-up of everything that took place at this year’s Google Cloud Next, including a run through of all the key announcements made at the show and what they mean for the enterprise.